Fourteen people have been found hidden in the back of a refrigerated truck on a ferry that docked in the Republic of Ireland on Sunday. Eleven men, two women and a child were found on a container lorry on the Oscar Wilde ferry which had travelled overnight from Cherbourg, France. Garda Immigration officers found them during a routine search after the boat docked at Rosslare at about 14:00 BST. It's understood they are all in good health. One man was taken to hospital in nearby Wexford as a precaution. The child was accompanied by both parents. The group is understood to be from Afghanistan and Iran and includes some Kurdish Iranians. Over the past two years, 120 people have been found trying to enter Ireland by immigration authorities. 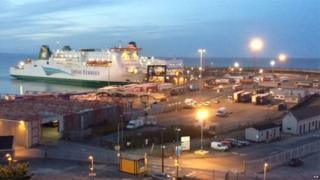 The majority of them arrive via Rosslare. It is expected that those found will be referred to Ireland's refugee application process.